The reenactments, which are part of the events for Montana’s city holiday celebrated every year on Pentecost, have been attended by hundreds of local residents, reports Bulgarian daily Standart. As part of the ritual “Bread of God", the reenactors prepared bread from spelt (also known as dinkel wheat or hulled wheat), one of the civilized humans’ first cultivated foods (about 7,500 BC). 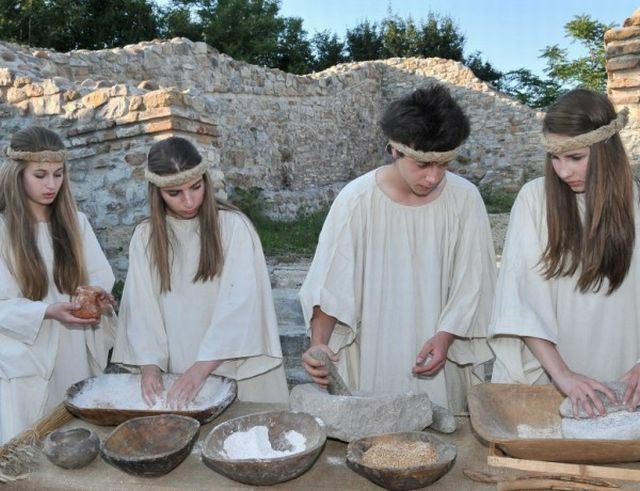 They ground the spelt into flour, kneaded the flour into the dough, and baked the dough into “Thracian" bread right there on the spot in the Montanesium Fortress, and then distributed to the audience. The other reenacted Thracian ritual was entitled “The King-Priest, Dionysus, and the Wine". In it, the wine was mixed and poured into phiales which are replicas of the Ancient Thracian treasure discovered in the northwestern Bulgarian city of Vratsa known as the Mogilanska Mound Treasure or the Vratsa Gold Treasure. The audience was rather impressed with the Ancient Thracian rituals, which were restored by experts from the Vratsa Regional Museum of History, and reenacted by teenage performers from the Vratsa-based Temp Drama Club. The reenactments took place at the southeastern gate of the stone citadel of the Montenesium Fortress. The originally Ancient Thracian, and later Roman fortress was partly restored in 2012-2014 to create a cultural tourism attraction with BGN 1.3 million (EUR 665,000) in EU funding under Operational Program “Regional Development". The early history of today’s northwestern Bulgarian city of Montana is primarily associated with the Ancient Roman military camp and later city and fortress of Montanesium, initially known as Castra ad Montanesium (“castra" meaning “camp" in Latin) from the Roman Antiquity period (1st-4th century AD). However, the earliest traces of civilized life on the territory of Bulgaria’s Montana date to the Chalcolithic Age (Aeneolithic, Copper Age), from the 5th-4th millennium BC, and have been discovered in the lower archaeological layers on the site of the Montanesium Fortress. During the 1st millennium BC the place was inhabited by the independent Ancient Thracian tribe Triballi, which was allied with the Odrysian Kingdom, the most powerful Ancient Thracian state. From this period, the Montanesium Fortress features preserved sections of the pre-Roman, Ancient Thracian fortress wall, over 1 meter thick, which is located under the Roman fortress’s large fortress tower. The Roman Empire conquered the region of Montana in today’s Northwest Bulgaria around 29 BC (all of Ancient Thrace south of the Danube was conquered by Ancient Rome in 46 AD) setting up a military camp, Castra ad Montanesium, on top of the existing Ancient Thracian settlement. The archaeological sources about the history of the Roman city of Montanesium come largely from Roman epigraphic monuments. The Romans were interested in the region of Montana because of its ore deposits and the opportunities for mining gold, silver, lead, and iron, especially along the Ogosta River and the Zlatitsa River. The region was one of the major gold mining centers in the Balkan Peninsula in the 1st-3rd century AD. The earliest known Roman military detachment to set up camp at Montanesium in the 1st century AD was Cohors Sugambrorum. The epigraphic monuments indicate the intensified presence of Roman servicemen from Legio I Italica (Italian First Legion) and Legio XI Claudia (Claudius’ 11th Legion) from the first half of the 2nd century AD until the middle of the 3rd century AD; Numerus Civium Romanorum was stationed there in the first half of the 3rd century AD, and Cohors III Collecta – in the middle of the 3rd century AD. The Roman military camp Castra ad Montanesium is mentioned in an inscription from 134 AD; as a result of its development as a settlement, in 160-161 AD, it received the status of a Roman city – municipium – with its own territory (Regio Montanesium) likely corresponding to today’s Bulgarian District of Montana located between the Danube River to the north, and the Balkan Mountains to the south. It was part of the Roman province Moesia Superior where it was the second most important city after the arsenal city on the Danube, Ratiaria (Colonia Ulpia Ratiaria), whose ruins pillaged by modern-day treasure hunters can be found today near Bulgaria’s Archar. In 271 AD, Roman Emperor Aurelian (r. 270-275 AD) transformed the province of Moesia Superior into the province of Dacia Aureliana with its capital at Serdica (today’s Sofia), after vacating Dacia Traiana beyond the Danube. Around 283 AD, Dacia Aureliana was divided into two provinces, Dacia Mediterranea, with its capital at Serdica, and Dacia Ripensis (“Dacia from the banks of the Danube") with its capital at Ratiaria (Colonia Ulpia Ratiaria), and Montanesium as its second most important city. The name of Montanesium is known from several epigraphic monuments from the 2nd-3rd century AD. Its etymology probably stems from the Latin words “mons" (mountain) and “montani" (mountaineers). Specific hypotheses about its origin range from the name of a Roman military detachment called Cohors Montanorum, which was stationed there in the second half of the 1st century AD (whose presence, however, is only indirectly implied in the sources), to the city’s location at the foot of the Balkan Mountains, and to a cult shrine in the pre-Roman settlement. The Fortress of Montanesium also had a large water spring. It was the site of an ancient rock shrine which was an important cult center during the Roman Age when pilgrims worshipped there a number of Ancient Thracian, Greek, and Roman deities, including Diana and Apollo, who were the city’s Hellenistic Age patrons, as well as Jupiter, Dionysus, Roman god of woods and fields Silvanus, medicine god Asclepius, also known as Aesculapius, and his daughter Hygieia, Thracian supreme god Heros, also known as the Thracian Horseman, Hermes, Heracles (also known as Hercules), Mars, Persian deity Mithra (Mitra), and the spring nymphs. Bulgarian archaeologists excavating the Ancient Roman city of Montanesium have discovered numerous sculptures, votive tablets, and inscriptions left as gifts by a wide range of pilgrims from the military, civilians, aristocrats, and common folk. Barbarian invasions by the Goths in the middle of the 3rd century AD disrupted the life of the Roman city of Montanesium leading to a reconstruction of its fortress. At the end of the 3rd and the beginning of the 4th century AD, around the time of the reign of Emperor Constantine the Great (r. 306-337 AD), Montanesium flourished together with the numerous Roman villas in its suburbs. The Antiquity shrine and the Roman villas were destroyed at the end of the 4th century AD in a new wave of Gothic invasions. Between 440 and 490 AD today’s Northwest Bulgaria was overrun by the Huns and the Goths; Montanesium waned until the 6th century AD when it was ultimately destroyed by the barbarian invasions of Avars and Slavs (between 500 and 560 AD), like the rest of the Roman cities in today’s Northern Bulgaria. The Slavs who settled there named the city Kutlovitsa which remained its name during the Bulgarian Empire in the Middle Ages. At the time of the Second Bulgarian Empire, in the 12th-14th century AD, Kutlovitsa was the center of a Christian eparchy. During the period of the Ottoman Yoke (1396-1878/1912), in 1688, Kutlovitsa, and more precisely a nearby area known as Zheravitsa, was the site of a major battle between the Bulgarian Catholic rebels who organized the Chiprovtsi Uprising, and the Ottoman Turkish forces. After Bulgaria’s National Liberation in 1878, Kutlovitsa received a city status in 1891, and was renamed Ferdinand after then Bulgarian Tsar Ferdinand (r. 1887-1918). In 1923, it was one of the centers of the botched September Uprising organized in the rural parts of the Tsardom of Bulgaria by the Bulgarian Communist Party with lavish funding from the Communist International (Comintern) and the Soviet Union. After Bulgaria was occupied by the Red Army in 1944, and the communists came to power in a coup d’etat, the city of Ferdinand was renamed Mihailovgrad in honor of Hristo Mihailov, a local communist functionary who was one of the leaders of the botched September Uprising. The city regained its Roman name Montana only after the communist period ended in 1989, in 1993, with a degree of Bulgaria’s first democratically elected President Zhelyu Zhelev (1935-2015). The Montanesium Fortress was partly restored in 2012-2014 as a cultural tourism site with EU funding from Operational Program “Regional Development", with a grant of BGN 1.3 million (app. EUR 665,000).